In recent time, Lifetime is producing great basketball variety by manufacturing high quality portable basketball system.Along with great quality it is also quite affordable. Lifetime is a renowned company and lays great concern on the durability and performance of its product. Hence the less expensive options can work better due to strong backboard which is made of high quality material and comes with a good support. 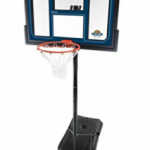 To sharpen and perfect your basketball skills in spare moments by performing all such drills in your home backyard with the Lifetime 71525 in-ground basketball Review system. This system is installed permanently on cemented surfaces, having advance features such as unbreakable backboard, spring-back slam rim and power lift pole procedure for making the height change quickly and easily. 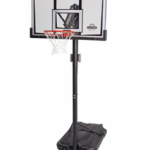 The 71525 basketball hoop by Lifetime, is considered one of the best models for intermediate athletes. 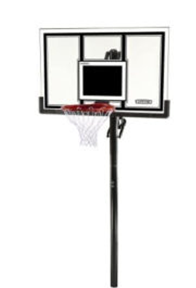 Having a 54 inch polycarbonate backboard, this model provides sufficient space to make your game reach certain heights. You can easily adjust the rim height in a range between 7.5 feet to 10 feet with an unlimited increment due to power lift adjuster. The height adjuster is very convenient and can be used single handedly. The steel pole is very large having a diameter of 3.5 inches, thus providing extensive robustness while the system is in use. 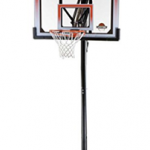 The backboard material has a steel frame which makes the rebounding of the ball very impressive. 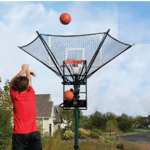 Also, 71525 includes a slam it breakaway rim and an all-weather nylon net. 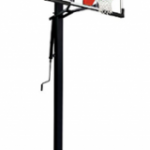 The features of Lifetime’s 71525 are considered one of the best for an in-Ground basketball system. However, Lifetime upgraded its system to 7888 basketball hoop, in which the only change itmade was of pole which had a 4 inch of square. Lifetime’s 71525 provides the biggest round pole, the biggest backboard and one of the biggest square frames for this type of system. Therefore, there are plenty of pole sizes available that are offered by Lifetime, which are of 2.75 inch, 3 inch and 3.5-inch pole models. Just like poles, they also have a good range of backboards which are starting from the smallest size of 44-inch width to 54 inches, same as 71525. The frame of these backboards comes in either steel or plastic. The frame of 71525 is made of 1 inch steel, which gives extensive support and durability for backboards and the mounting arms from the pole. 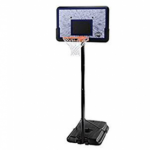 With a 54-inch unbreakable backboard made with Makron poly-carbonate, this on field basketball system is a very outstanding hooping set, which is very easy to assemble and install. However, it is suggested to thoroughly read the manual which is included in the package so that the assembling becomes faster without misplacing the components. For moving the system from one place to another, you can buy a sleeve except of fitting it directly to the ground. The dimensions of the breakaway rim are pretty much standard, having an 18 inch diameter and a nylon net which is ideal for every weather condition. The color of the rim is orange while the nylon net comes in standard white color. The nylon net comes with a 12 looping design and the breakaway mount is used to withstand high intensity games. Steel metal hooks are welded to hold up the nylon net with rim, thus having no excessive plastic clips. 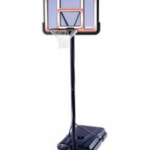 Basketball Reviews Having the power lift height adjustment system, the variance of height becomes comparatively easy as you just have to press the handle and then lift the basket accordingly. With an adjustment range from 7.5 to 10 inches, it comes with unlimited increment giving you the independency on selecting your desired height. The backboard is constructed with heavy materials which can handle abusive play and climatic change. The powder coating protects the steel pole from such weather conditions and hence reduces the risk of rust and corrosion. It is suggested to increase up the base of pole very strongly with cement which will make the system heavy enough to withstand regular strength abuse. Thus, with an easy height adjustment, convenient assembly and high quality rims, the 71525 is very popular among basketball players. 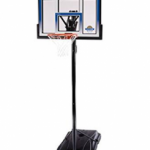 Lifetime 71525 in-Ground basketball system comes with a thirty-day money back guarantee for the people who are not fully satisfied with the product. By just keeping the original packaging you can contact them within 30 days and they will be on your doorstep having your full refund. With this gesture, you can see how loyalLifetime is toits customers. This in-Ground basketball system is applicable for rough, high intensity gameplays because of itsdurability and high quality. The backboard comes in 54 inch size and is made of heavy Makrolon polycarbonate for unbreakable action. Height can easily be adjusted with power lift height adjustment system in a range of 7.5 feet to 10 feet with only using one hand. The rim is slam it pro having dual compression springs to give maximum elasticity while dunking, along with an all-weather nylon net. The backboard is molded with frame pad to give extensive protection while dunking. After purchasing Lifetime 71525 In-Ground Basketball Reviews 2017 system, I’ve come to a point that this is a quite satisfactory product with some major assembling problems but also consists of high quality components. Starting from the assembling process, the pole needs to be fitted rigidly in the ground after 40 inches deep digging. The instructions given on the manual are not really understandable however, after doing some research on the internet, I was able to assemble this system. My brother assisted me during assembling as this thing can’t be done single handedly. Once I was done setting up, I took up some shots towards the backboard.During the shots,I experienced that the top is vibrating and after impact the ball is bouncing off and hence making an annoying sound. After seeing this, I tightened all the screws and nuts again, but the vibration and sound was still coming. Though, as said in description this system can withstand high intensity game plays but after seeing such vibration and sound I don’t really think that this product is recommended for dunking and layups. Overall, Lifetime is a renowned company who has made extensive reputation by its high quality construction, rust resistant finished, powder coated steel and backboard having UV protection. But after playing on 71525 In-Ground Basketball system, I think Lifetime hasn’t done that exceptional work on this product. The power lift height adjustment is very easy to use which can make the backboard go up and down with ease. The vibration of pole and backboard when the ball hits it is amazing. The new power lift invention makes this product compatible for every age and skill. Dual spring slam it rim are of very high quality considering the price of this system. Is a good value purchase. The support for backboard is not really up to the mark. Acrylic backboard will give more durability than Makrolon polycarbonate backboard. Set up instructions are not very well written. Assistance is required to set up the pole. Needs proper digging to cement up the pole.